After Hisek Aim, he Fire, dealing massive damage split among all players in a line with the target. Kaz'tik's Hungry Kunchongs instantly devour anyone who touches them, except when feeding on a Mesmerize player. • [NO DIFFICULTY] Paragon's Purpose - Whenever a Klaxxi Paragon is defeated, all other active Klaxxi Paragons heal to full and gain a 10% damage bonus. • Ready to Fight - Klaxxi Paragons with this aura on them will be the next to join the fight. Before the fight begins, three Klaxxi Paragons will have this aura. When the encounter begins all three of these Paragons join the encounter and one other Paragon will gain this aura to indicate that they will join the fight next. Everytime a new Klaxxi Paragon joins the fight, one of the inactive Klaxxi Paragons will gain this aura. • Power of the Paragons - After a Paragon has been defeated, one player may take the fallen Paragon's powers to use as their own. Only one player can take any one Paragon's power, and a player may only take a Paragon's power once during the encounter. Each Paragon's powers can only be acquired by particular class roles. • Hewn - The attacks of Skeer the Bloodseeker leave the victim more susceptible to the meddling of Rik'kal the Dissector's attacks. The victim suffers 10% more damage per application from Rik'kal the Dissector. • Bloodletting - Skeer swings his weapon in a mighty arc, inflicting Physical damage to the target and causing blood creatures to spawn around the room. Each blood moves to a Paragon and will heal that Paragon based on the remaining health of the blood. In 10 Player Normal Difficulty 2 bloods are summoned. In 25 Player Normal Difficulty 3 bloods are summoned. In 10 Player Heroic Difficulty 3 bloods are summoned. In 25 Player Heroic Difficulty 4 bloods are summoned. In Raid Finder Difficulty 1 blood is summoned. In Flexible Difficulty 2-3 bloods are summoned. • Bloodthirsty - Players of the damage dealer role can acquire this Paragon Power. When activated all attacks over the next 10 seconds have a chance to spawn blood orbs that persist for 30 seconds. If any player walks through a blood orb they will heal for 10% of their maximum health. • Genetic Alteration - Rik'kal's meddling with his victim's genetic makeup leaves them more susceptible to the attacks of Skeer the Bloodseeker. Victims suffer an additional 10% damage from Skeer the Bloodseeker for each application of Genetic Alteration. • [NO DIFFICULTY] Injection - Rik'kal Injects his victim with a virus that inflicts 40000 Nature damage per second per application. When the virus expires, several Parasites will burst from the victim and attack players at random. Injection will not hit tanks that are actively trying to mitigate damage. • Amber Parasite - Amber Parasites are Genetically Modified and fixate on a random player when they spawn. The Amber Parasite Feeds on the fixated target. • Genetic Modifications - Rik'kal's Bioengineering abilities have given these parasites the ability to fully regenerate every 10 seconds. • Feed - Amber Parasites inflict 77999 Physical damage each second. • Mutate: Amber Scorpion - Rik'kal tosses a vial at a random player, causing them to mutate into an Amber Scorpion. While transformed, the victim suffers 50000 Fire damage per second and only has access to the abilities of an Amber Scorpion. Damage inflicted as an Amber Scorpion is based on the player's Attack Power, Ranged Attack Power, or Spell Power, whichever is largest. • Claw - Amber Scorpions can lash out with one of their claws for 100% damage. • Swipe - The Amber Scorpion sweeps both of its claws in front of it, inflicting 150% damage to all targets in the area. Targets currently under the effects of Sting suffer double damage. • Sting - The Amber Scorpion Stings the target, causing it to suffer Nature damage every second. • Prey - Mutated Scorpions can instantly kill an Amber Parasite with this ability. In Heroic Difficulties mutated victims must use this ability or perish from Faulty Mutation. • [NO DIFFICULTY] Faulty Mutation - In Heroic Difficulties, mutated victims suffer a Faulty Mutation. If the victim fails to Prey on an Amber Parasite before the Faulty Mutation expires they will perish. • Mad Scientist - Players of any role can acquire this Paragon Power. When activated the caster mutates into a giant amber scorpion. Damage inflicted by the scorpion is based on the highest available attack or spell power of the caster. While mutated the caster suffers 50000 Physical damage per second from the shock. The mutation lasts for 30 seconds. • Multi-Shot - Hisek the Swarmkeeper fires a shot at several random players for Physical damage. • [NO DIFFICULTY] Rapid Fire - Hisek fires several volleys in rapid succession, with each successive volley moving slightly faster than the previous one. Players caught in the path of the volleys suffer 284999 Physical damage each second they are in the volley. • Aim - Hisek the Swarmkeeper selects a player at random and stuns them for 5 seconds. If the target is too close they will be knocked back until they are 45 yards from Hisek. After Hisek is finished aiming at the target he will Fire a beam of 1400000 Physical damage at all targets between him and the victim. Damage is shared between all targets equally and each target hit by the beam will create a field of Sonic Resonance at their location that inflicts 92499 Physical damage to all targets within 5 yards of the victim. • Compound Eye - Players of the damage dealer role can acquire this Paragon Power. When activated, the player fires a shot at the target that inflicts greater Physical damage the further away the target is. Successfully hitting the target afflicts it with Marked for Death, increasing its damage taken by 15% for 10 seconds. • Flash - Ka'roz charges around the raid toward random targets. All players caught in his path are afflicted by Whirling. • Whirling - Player caught in Ka'roz's path as he Flashes around spin around and suffer 200000 Physical damage per second. Any other players caught in the vicinity of a Whirling victim also suffer this damage. • Hurl Amber - Ka'roz will periodically jump up to one of the platforms located about the room and Hurl Amber down at his enemies. Wherever the amber lands a pool of Caustic Amber will form. Players that enter a pool of Caustic Amber will suffer 138749 Nature damage every second they remain in the area. In non-Heroic Difficulties, Ka'roz hurls three pieces of amber. In Heroic Difficulty Ka'roz hurls four pieces of amber and the pool of Caustic Amber persists for the duration of the encounter. • Strong Legs - Players of the damage dealer role can acquire this Paragon Power. When activated the player leaps to one of the platforms Ka'roz used to Hurl Amber from. If there is an amber at the platform the player leapt to they have the opportunity to throw the amber down to create an Amber Explosion for 36000 Nature damage to all enemies within 15 yards of the impact. If there is no amber at the platform or when the player successfully throws the amber they will jump back down automatically. Hurled Amber will destroy the amber summoned by Korven to heal himself or his allies. • Encase in Amber - If Korven the Prime or any other active Paragon is below 50% health remaining Korven will Encase them in Amber for 10 seconds. If the amber is not defeated within 10 seconds the target will be restored to full health. This ability cannot be used more than once every 30 seconds. The explosion from the Hurl Amber ability acquired from Ka'roz after he has been defeated will destroy the amber summoned by this ability. In Heroic Difficulties the Amber summoned by this ability is immune to all player abilities. • Shield Bash - Korven the Prime slams his shield into his primary tank target, knocking them down and stunning them for 6 seconds. The victim is defenseless for the duration. Immediately after using Shield Bash, Korven the Prime unleashes a Vicious Assault. • Vicious Assault - Korven the Prime follows up his Shield Bash with 6 different strikes at all targets in front of him. The first strike causes the victim to suffer 200000 Physical damage every 3 seconds. Each successive strike inflicts greater and greater Physical damage. • Master of Amber - A player of the tank role can acquire this Paragon Power. When activated the caster Encases a friendly target in Amber for 5 seconds. While the amber holds the target is immune to all damage. • Calculate - When Iyyokuk the Lucid enters the fight he perceives the general attributes of all players and notes the result of his calculations on each target. These calculations are noted with a shape, a color, and a number. Possible shapes are: - Mantid - Sword - Staff - Drum - Bomb Possible colors are: - Red - Purple - Blue - Green - Yellow Possible Numbers Range from 1 to 5. • Diminish - Iyyokuk uses his command of the arcane to alter the victim's health by 34% of its current value. If the target is below 25% of their maximum health they will die instantly. • Insane Calculation: Fiery Edge - Iyyokuk peers through the veil of his previous calculations and selects an initial target, then all other targets based on the initial target's criteria to spawn lines of fire between them. All targets and any victims caught in the lines between them suffer Fire damage every second. The damage decreases as the endpoints of the line get further away from one another. In 10 Player Normal and Raid Finder Difficulties, Iyyokuk selects all targets that match one of the intial target's criteria. In Flexible Raid Mode, Iyyokuk selects all targets that match either of one or two of the initial target's criteria. In 25 Player Normal Difficulty, Iyyokuk selects all targets that match any of two of the initial target's three critera. In 10 Player Heroic Difficulty, Iyyokuk selects all targets that match any of two of the initial target's three critera. in 25 Player Heroic Difficulty, Iyyokuk selects all targets that match any of the initial target's three criteria. In Heroic Difficulty, each target creates a line of fire between themselves and two other targets. • Ingenious - Players of the healer role can acquire this Paragon Power. When activated the caster heals the initial target. The heal is then copied to other members of the raid. 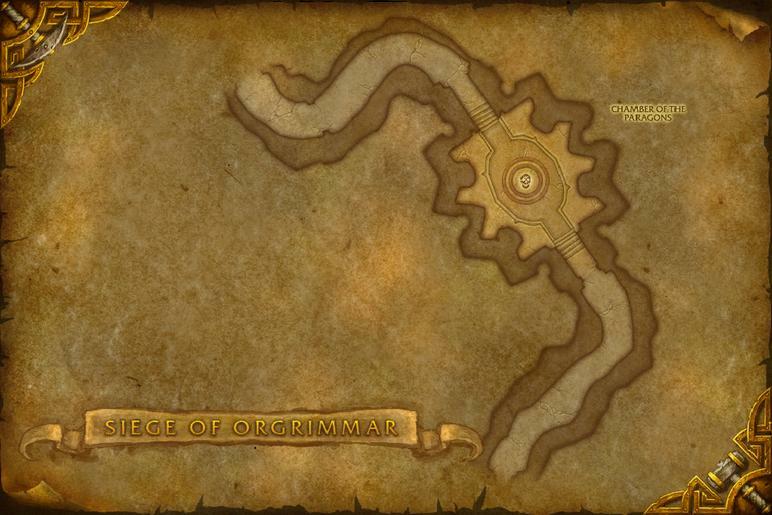 In Normal and Raid Finder Difficulties the heal is copied to anyone that shares the race or class of the initial target. In Heroic Difficulty the heal is copied to all other raid members who share the class of the initial target. • Toxic Injection - When Xaril joins the encounter, he randomly injects all players with one of three different toxins: red, blue, or yellow. • Caustic Blood - Successful melee strikes from Xaril inject a caustic poison into the victim. The injection inflicts 50000 Nature damage per application to the target every second for 12 seconds. If the injection is allowed to stack to 10, a Bloody Explosion occurs. Caustic Blood will fail to hit tanks who are using their Active Mitigation abilities. • Bloody Explosion - Allowing Caustic Blood to apply 10 times results in a Bloody Explosion, inflicting 600000 Fire Damage to the entire raid. • Tenderizing Strikes - Xaril's dagger strikes tenderize the flesh of his victim. Any attacks received from Kil'ruk the Wind-Reaver will inflict 10% more damage for each application of Tenderizing Strikes. • Choose Catalyst - Xaril the Poisoned Mind selects a catalyst at random and strikes all members of the raid with a toxin that matches the color of the catalyst. This catalyst causes all targets' toxins to react according to the type of toxin. • [NO DIFFICULTY] Catalytic Reaction: Red - When this toxin reacts to a red catalyst it explodes for 389999 Fire damage to all players within 10 yards. • [NO DIFFICULTY] Catalytic Reaction: Blue - When this toxin reacts to a blue catalyst it explodes for 800000 Frost damage divided among all players within 10 yards. In 10 Player Difficulty, the maximum number of targets that can split the damage is limited to 2. In 25 Player Difficulty the maximum number of targets that can split the damage is limited to 3. • [NO DIFFICULTY] Catalytic Reaction: Yellow - When this toxin reacts to a yellow catalyst it creates a cloud of Noxious Vapors for 30 seconds. Player caught in the cloud suffer 146249 Nature damage per second. • [NO DIFFICULTY] Catalytic Reaction: Orange - When either a yellow toxin or a red toxin reacts to this catalyst, a ring of Fire explodes outward. Players do not see or need to react to the ring that forms at their own feet; but must avoid those rings that are created by their allies. • [NO DIFFICULTY] Catalytic Reaction: Purple - When either a blue toxin or red toxin reacts to this catalyst the victim will be forced to run forward, leaving a trail of Canned Heat in their wake for 40 seconds. Players stepping into the area suffer 121874 Fire damage every second they remain in the area. • [NO DIFFICULTY] Catalytic Reaction: Green - When either a blue or yellow toxin reacts to this catalyst a small cloud of Eerie Fog will form and wander about randomly. Players who enter the area suffer 121874 Nature damage per second for 9 seconds. Entering the area Chills victims to the Bone, increasing the damage received from the Eerie Fog by 30% for 1 minute. Every time a player enters the area the fog reduces in size. When it has been reduced in size 3 times it will dissipate. • Vast Apothecarial Knowledge - Players in the healer role may acquire this Paragon Power. When Apothecary: Knowledge is activated, all healing done for the next 10 seconds will leave a Volatile Poultice on the target for an amount equal to the healing done. The next time the target is damaged, the Volatile Poultice releases the stored healing on the target. • [NO DIFFICULTY] Hungry Kunchongs - These Hungry Kunchongs are summoned by Kaz'tik the Manipulator. Whenever one dies Kaz'tik will summon another to take its place. • Devour - When Kaz'tik the Manipulator Mesmerizes a player, a Hungry kunchong is selected to feed on the victim. While the Kunchong Feeds the victim suffers 100000 Physical damage and the Kunchong gains 5 Energy each second. If the Kunchong suffers 30% of its total health in damage from the time it began to Feed on the victim, the Feeding will stop and the victim will be freed of the Mesmerize. • Devour Whole - Hungry Kunchongs will instantly kill any player who gets too close. The process energizes the Hungry Kunchong to full. • Thick Shell - When not in the process of Feeding, Hungry Kunchongs are immune to all damage. The impact of the player ability, Angel of Death, gained from Kil'ruk after he has been defeated will disable a Hungry Kunchong's Thick Shell. • Molt - A Hungry Kunchong that reaches full energy will Molt. The process transforms the Hungry Kunchong into a Mature Kunchong. • Mature Kunchong - Mature Kunchongs will ignore normal attempts to control them and attack any players nearby with their newly acquired ability: Swipe. • Swipe - The Mature Kunchong swings both of its massive pincers, inflicting 600000 Physical damage to all targets in front of it. • [NO DIFFICULTY] Mesmerize - Kaz'tik selects a random member of the raid and forces them to walk toward one of his Hungry Kunchongs. If the victim is allowed to reach the Kunchong they will be Devoured Whole. • Sonic Projection - Kaz'tik selects a random member of the raid and fires a sonic wave in their direction. Player caught in the path of the wave suffer 346874 Physical damage. • Master of Puppets - Players of any role may acquire this power. When activated the player summons an Immature Kunchong to fight at their side for 40 seconds. • Exposed Veins - Kil'ruk the Wind-Reaver's sharp blades expose the blood vessels of his victims, making them more susceptible to the attacks of Xaril the Poisoned Mind. All damage taken from Xaril the Poisoned Mind is increased 10% for each application of Exposed Veins. • Gouge - Kil'ruk the Wind-Reaver incapacitates his current tank target. This attack is followed immediately by Mutilate. • Mutilate - Kil'ruk the Wind-Reaver lashes out with both of his weapons for a devastating attack. • Death from Above - Kil'ruk the Wind-Reaver leaps into the air over a random player and then crashes down. Kil'ruk inflicts Physical damage to all enemies within 8 yards upon landing. • [NO DIFFICULTY] Reave - Kil'ruk leaps to a random player and begins to spin in place. 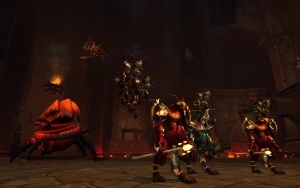 All players are drawn toward Kil'ruk and suffer Physical damage for 9 seconds. The damage each player suffers during Reave is decreased as the player gets away from Kil'ruk. • [NO DIFFICULTY] Reave - Players of the damage dealer role may acquire this power. Activating this ability causes the caster to leap forward a fixed distance and inflict Physical damage to all enemies within 10 yards of the impact. If a Hungry Kunchong with a Thick Shell is in the area of impact, the Thick Shell will be disabled.